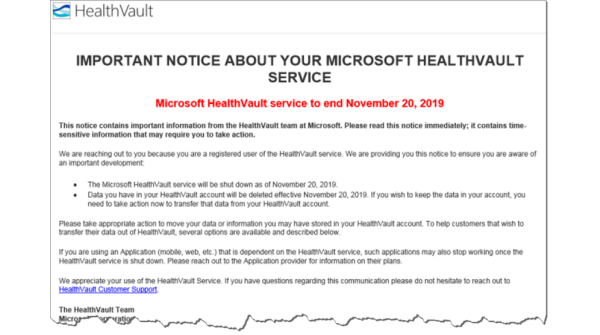 Microsoft is shutting down its personal health record (PHR) service, HealthVault. As recently as 2017 the platform was announcing upgrades but the personal health record business is difficult. It combines the burden of heavy security and regulation with the unwillingness of consumers to pay anything for it. Not exactly a winning combination. The companies positioned to actually execute and benefit from PHRs are Apple and Google with their integrated mHealth products on their mobile platforms.